Collie Eye Anomaly (CEA), also known as choroidal hypoplasia (CH), is an inherited disease affecting several dog breeds including border collies. The choroid is the layer of tissue in the eye responsible for supplying blood and nutrients to the Retina. In dogs affected with CEA, the choroid does not develop properly and is therefore thinner than normal. The severity of the condition can vary from dog to dog. In mild cases, affected dogs may only show signs of collie eye anomaly on eye exam between about 5 and 12 weeks of age, just prior to normal, age-related pigmentation of the retina which often masks the characteristic, disease-related changes. After this time period, mildly affected dogs may be impossible to distinguish from normal dogs on eye exam (a phenomenon often referred to as “going normal”) and may not display obvious vision deficits. In more severely affected dogs, clinical signs include malformations of the eye and/or optic nerve (colobomas), retinal detachment, intraocular bleeding, and subsequent blindness. Both mild and severe forms of CEA are associated with the same NHEJ1 gene Mutation. Therefore, predicting the potential severity of the disease in an affected puppy is difficult as mildly affected parents may produce offspring that are severely affected. The Mutation of the NHEJ1 gene associated with collie eye anomaly has been identified in the border collie. Though the frequency of the gene mutation in the overall border collie population is unknown, in one study the disease prevalence in the United States, Great Britain and Switzerland was estimated to be 1-3%. Genetic testing of the NHEJ1 gene in border collies will reliably determine whether a dog is a genetic Carrier of collie eye anomaly. 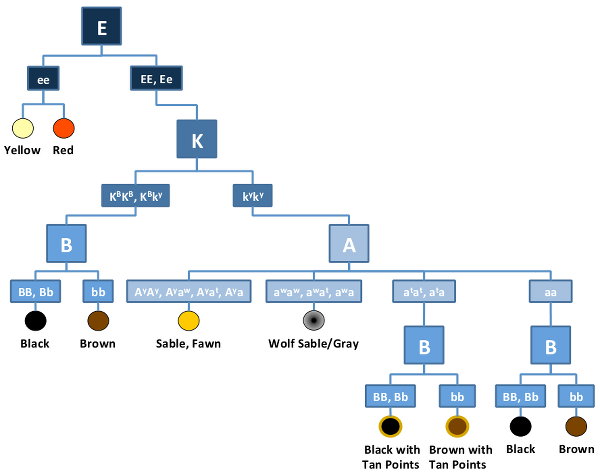 Collie Eye Anomaly is inherited in an Autosomal Recessive manner in dogs meaning that they must receive two copies of the mutated gene (one from each parent) to develop the disease. In general, carrier dogs do not have features of the disease but when bred with another carrier of the same Mutation, there is a risk of having affected pups. Each pup that is born to this pairing has a 25% chance of inheriting the disease and a 50% chance of inheriting one copy and being a carrier of the NHEJ1 gene mutation. Reliable genetic testing is important for determining breeding practices. In order to eliminate this mutation from breeding lines and to avoid the potential of producing affected pups, breeding of known carriers to each other is not recommended. Border collies that are not carriers of the mutation have no increased risk of having affected pups.